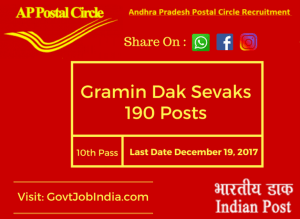 Andhra Pradesh postal Department has recently announced latest ap postal recruitment 2017 notification for the post of Gramin Dak Sevak for 190 vacancies. The candidates must have passed 10th standard from a recognized institute or board. 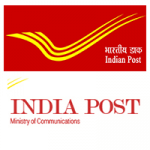 Andhra Pradesh postal department giving opportunity to eligible candidates to apply online through indiapost.gov.in portal before the Last Date (December 19, 2017). The application form can be filled online on their official website portal (www.indiapost.gov.in). The age limit for the post will be considered for minimum 18 years old and should not exceed 40 years of age. To get the details about age relaxation, look into the details given below. The AP postal circle selection of the candidates will be done according to their merit list. Listed below are all the employment details about the Gramin Dak Sevak post in the Andhra Pradesh. Pay Scale: the pay scale for the post is yet to be mentioned. Nationality: Indian citizen apply for the post. Academic Qualification: The postal circle of Andhra Pradesh recruiting candidates who have the eligibility criteria to apply for the post. The post requires candidates who have passed 10th standard from a recognized institution or board. The given criteria are important for the post of Gramin Dak Sevak. The candidates must have a passing certificate of matriculation/ 10th standard from an approved board or university. Preference will be given to the students having higher aggregate marks. Age limit: Anyone between 18 years of age and 40 years of age can apply for the post, considering the number of openings and age relaxation. Selection Procedure: Selection based on Merit list. Only the marks obtained in the 10th standard will be considered in the selection process. Passing of all the subjects will be mandatory to get selected for the post. In case same marks/ percentage the candidates will be selected according to DOB (higher age as merit), ST female, SC female, OBC female, UR female, ST Male, SC Male, OBC male, UR male. Application Procedure: the online application procedure is listed below. Please follow the given steps to apply online properly. Candidates have to register themselves online for the application through the given portal https://indiapost.gov.in or http://appost.in/gdsonline and ensure all the important details are put in the correct field. Any candidate who forgot the registration number can retrieve the registration number through option ‘Forgot registration’. Note: Any candidate who has previously registered cannot register twice. Doing so will lead to the disqualification of the registration. Application fees: Candidates are required to pay INR 100/- for OC/OBC which can be paid at any post office near your area. Free application for all female, SC/ST, PH candidates.